TEL AVIV– The other day I spoke at an Israeli event called Techonomy where six handpicked Israeli startups were demoing new products. The companies were impressive, the audience packed, it was sponsored by blue-chip tech names, and well-heeled experts were on stage offering feedback. In fact, it could have been just like a Silicon Valley event a la TechCrunch 50 in every way except one: Experts and attendees were encouraged—strongly—to offer only positive feedback. To understand how rare that is, witness the daily blog posts calling out Valley startups—even the most successful ones—for lacking a business model, redesigning a home page or just generally “sucking.” Or just read the comment stream on any TechCrunch post. Everyone surrounding the Silicon Valley ecosystem is a critic, and if they’re anonymous, a vicious one. Hell, Michael Arrington gets spit on and half of my career has been made profiting from anonymous, vitriolic haters. And we just write about startups. I don’t like it, but that’s the unfortunate reality that goes along with doing my job. A lot of this insistence on positivity comes from the Godfather of the Israeli Web scene, Yossi Vardi . It’s one of the main house rules at his KinnerNet conference, where he tells people if you don’t agree with something someone else is saying maybe you are the problem. Well said, Mr. Vardi. The amazing thing is how people respect the rule. 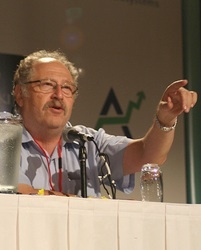 Vardi invokes a combination of fear, respect and sucking up among Web entrepreneurs in Israel, so when he demands people be nice, they actually listen. He came up to me after the Techonomy event, and I was slightly worried he was about to yell at me for saying one of the presenting companies needed a better logo because you couldn’t decipher its name. (Sort of a problem with a consumer Web business, if you ask me.) Instead, we got into an interesting talk about this insistence on positivity. In short, he wants to promote a comfortable environment where smart entrepreneurs who may be easily intimidated aren’t driven out of the industry. I can understand that. I think a lot of the criticism written about Valley startups is uncalled for at best, and at worst just not that interesting. Many people try to hold startups to an impossible bar. They are startups after all. They are supposed to be doing something that is risky, seems insane and can easily fail. If they aren’t, they’re probably not taking enough risk. Most lazy bloggers and commenters have learned one thing: If you want to maximize the odds that you’re right about a startup, then trash them, because most startups fail. It’s much harder to believe in something, and harder still to say you do. That said, I’m not sure I understand the concept of “constructive positivity.” I think a lot of startups benefit from, well, honesty. And honesty isn’t always nice. Take the first post I did on Israel. Sure, some people think the Dow Jones numbers are understating returns. But no one will argue that Israeli returns have actually been good in the last eight years. Guess what: They haven’t been great in the Valley either, something people write about all the time. You never hear an uproar, because it’s true. VCs, entrepreneurs and the whole Valley ecosystem gets it, knows it’s a problem and everyone is quietly trying various ways to solve it. If people were openly talking about the poor returns in Israel—the way they do in the Valley—would there have been such an uproar? Or would people just wince, nod, and aim to be the exception? I’ve spent a lot of time talking to people in Tel Aviv about this idea of honesty—something Israelis are supposed to be known for. Essentially people have said everything about Israel inflames passion. OK, that’s a fair point and understandable. But the government, entrepreneurs, and investors can’t court mainstream U.S. bloggers and business press for coverage and not expect the same rules by which we write about our own startups, even the standout ones like Facebook and Twitter. That’d be a bit like me saying people should be nice to me because I’m a woman, wouldn’t it? But here’s where Vardi’s view of the world makes sense: He doesn’t aim for his companies to build empires worth a billion or even hundreds of millions of dollars. What’s more, he said it’s unfair to expect them to. He told me after the event that Israeli companies are great at coming up with technology that a bigger company, with a bigger market, and more resources can then develop. He called them “tomato seeds”—there is a lot packed in there, but it’s not going to grow into a tomato plant on its own. And indeed, Vardi has had a good number of exits and made money off them based on this theory. Of course, the natural question then is, should big venture capital money even be in Israel to begin with? I asked Vardi, and he said it was a good question. He noted that big venture capital money shouldn’t be funding Web applications, period, given the low capitalization and relatively small exits. Agreed. One of the main themes in my book about Web 2.0 is the comparatively-low importance of big money in this wave of companies, and that’s why you’ve seen such a different role played by angels and the emergence of strong seed funds like First Round Capital over the last few years. Ideally, I think a mix between the positivity of the Israeli scene and the honesty of the Valley scene would be an improvement for both communities. But, I’ll grant Vardi that companies just aiming to build a product, don’t deserve a Facebook-level of scrutiny and should be nurtured. But, that means as someone who writes for primarily a U.S. business audience, I also probably shouldn’t be flying around the world to cover them. In short, Israeli entrepreneurs can’t have it both ways. I, for one, continue to believe big things can come out of Israel, the same way they can come from anywhere. After just two weeks of foraging, I’ve found a handful of entrepreneurs swinging for the fences and building real, viable companies that I expect to watch for years to come. As someone who gets paid to analyze and ask uncomfortable questions, I’m going to hold those companies to the same bar that I hold any company with potential in the Valley to. And if any entrepreneur doesn’t want that kind of coverage: Don’t call me for a meeting.